Do you want to be on time? Presenting is tough at the best of times. Well planned on-time presentations mean you’re not rushing, you get to communicate ALL of your key messages and most importantly, your audience isn’t left wondering what just happened with no time to engage with you and your awesome content. PowerPoint™ provides you with a built-in Rehearse Timings feature to assign automatic slide-advancement times but it doesn’t really help you plan the timing of your delivery when you are physically present with your audience. That’s where TalkTime for PowerPoint comes in. 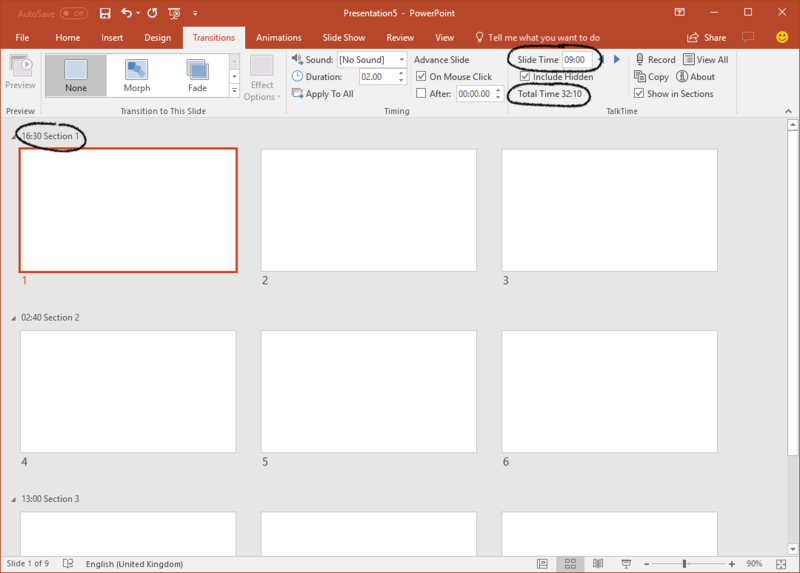 TalkTime is an add-in for PowerPoint which integrates inside your existing ribbon, right within the Transitions tab. TalkTime is easy to use. You can copy PowerPoint’s rehearsal times into TalkTime, enter them manually for each slide, record timings from a normally delivered slideshow or even copy times from audio narrations. TalkTime keeps a track of the total time you plan to spend talking through your presentation and even takes into account hidden slides. When using the standard Sections feature of PowerPoint, TalkTime will also prefix your section names with the subtotal time for each section. In the example above, you can see that the first section is due to take sixteen and a half minutes to present, nine minutes is planned for the first slide and the total TalkTime for the whole presentation is just over thirty two minutes long. You can also quickly see a summary of the times you’ve set by clicking the View All button, clearly identifying those that haven’t been assigned times yet in red. 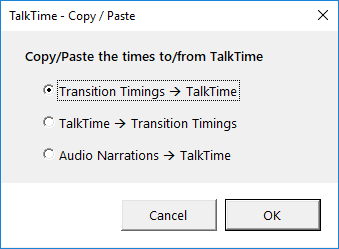 TalkTime adds your times in a standard format to standard PowerPoint files so that you can distribute them without recipients needing to install the TalkTime add-in, unless of course they want to see and/or edit the times in the Transitions tab. TalkTime provides a convenient way to copy timings to and from other elements of your presentation. 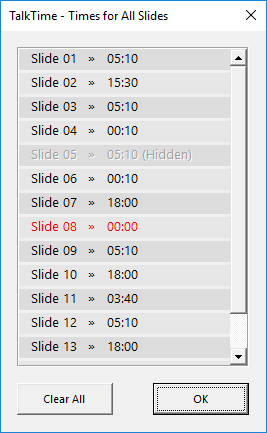 Let’s say you used Microsoft’s built-in Rehearse Timings feature to record your delivery timings but you don’t actually want the slides to advance automatically. You can use the Copy button to copy those timings to TalkTime and then select all of your slide before turning off the automatic advance check box. Conversely, you can do exactly the opposite and copy your timings from TalkTime to the slide transition times. And finally, if you’re creating a narrated presentation, perhaps exporting it to a video, you can have TalkTime find the playback time of the narrations for each of your slides and have those imported into TalkTime. When it comes to rehearsing your presentation, what better way to ascertain the times you’ll need for each slide in TalkTime than to record them. TalkTime has a special discrete mode for recording times. It doesn’t place a timer on top of your slide show or prevent you from using the Presenter Mode. Really we hear you say? Yes. It really is free. Why have we done this? Well, firstly, we’d like to see Microsoft implementing TalkTime-like functionality natively into PowerPoint and the more people that use it, the more likely that is to happen. Secondly, we just love doing what we do within the presentation and PowerPoint community and every now and then it makes us feel all warm and fuzzy inside to be able to give something back to our customers, partners and designer-users. And finally, it’s a demonstration of what partnerships can do. The TalkTime idea was conceived by Nolan Haims of PresentYourStory.com when he approached YOUpresent at the Presentation Summit in 2017. We hope you like what we’ve built together and we also hope you’ll think about us the next time you need presentation design or PowerPoint add-in creative services. What version of PowerPoint does it work with? Currently, sadly, no. The reason is that many of the programming interfaces we use to make it work aren’t available to developers of add-ins for PowerPoint:mac 2016. We tried and the result was a product we weren’t happy with so until Microsoft can provide developers with better tools and programming capabilities (especially application events), there’s nothing we can do but wait and hope for a better future. Because this is a free product we don’t provide any guaranteed level of support, unlike our paid-for products. We will however update this FAQ as and when applicable questions arise. Is TalkTime safe to use? We digitally sign all of our products (paid-for and free) for your security with a code-signing certificate granted to us by the approved CA (Certification Authority) Comodo. We recommend you don’t allow any Microsoft Office application to run add-ins or macros unless they are digitally signed by a bone-fide AuthentiCode CA-issued certificate (this doesn’t include self-signed certificates). This can be set in File / Options / Trust Center / Trust Center Settings Save / Macro Settings. In using TalkTime, we add metadata to your presentation using standard Microsoft interfaces that do not affect the validity or compatibility of the PowerPoint files you create or the ability to distribute them to anyone opening them with PowerPoint, with or without TalkTime installed.. If you need to, you can also remove this metadata by using the Clear All button in the View All window. Is there a license to use TalkTime? To keep this project as lean as possible, we haven’t built a complicated installer or all-encompassing 100-page long legal license. We do however grant anyone downloading and using TalkTime with a perpetual license to use it. Here is the plain-English license. The joint owners of TalkTime, Nolan Haims Creative and YOUpresent LLC, hereby grant you, the user, with a perpetual license to download, install and use TalkTime on as many Windows-based computers as required. You may keep copies of TalkTime. You may freely distribute TalkTime, as long as it is not in a commercial offering and that you attribute the product to Nolan Haims Creative and YOUpresent. You may not reverse engineer, decompile, modify, decrypt, copy or distribute any part of the code. You may not include TalkTime in any commercial offering without the prior approval of either Nolan Haims Creative or YOUpresent LLC. TalkTalk is joint copyright (c) 2017 of Nolan Haims Creative and YOUpresent LLC. All rights reserved. (i) YOUR USE OF THE SOFTWARE IS AT YOUR SOLE RISK AND LIABILITY. THE SOFTWARE IS PROVIDED ON AN “AS IS” AND “AS AVAILABLE” BASIS. NOLAN HAIMS CREATIVE AND YOUPRESENT LLC EXPRESSLY DISCLAIMS ALL WARRANTIES OF ANY KIND, WHETHER EXPRESS OR IMPLIED, INCLUDING THE IMPLIED WARRANTIES OF MERCHANTABILITY, FITNESS FOR A PARTICULAR PURPOSE, AND NON-INFRINGEMENT. (ii) NEITHER NOLAN HAIMS CREATIVE OR YOUPRESENT LLC MAKE ANY WARRANTY THAT (a) THE SOFTWARE WILL MEET YOUR REQUIREMENTS, (b) THE SOFTWARE WILL BE ERROR-FREE, (c) ANY RESULTS THAT MAY BE OBTAINED FROM USE OF THE SOFTWARE WILL BE ACCURATE OR RELIABLE, OR (d) ANY ERRORS IN THE SOFTWARE WILL BE CORRECTED. (iii) ANY MATERIAL DOWNLOADED OR OTHERWISE OBTAINED THROUGH THE USE OF THE UPDATE SERVICE IS AT YOUR OWN DISCRETION AND RISK. YOU ARE SOLELY RESPONSIBLE ANY DAMAGE TO YOUR COMPUTER SYSTEM, AND FOR THE LOSS OF DATA THAT RESULTS FROM ANY SUCH MATERIAL. (i) THE USE, OR INABILITY TO USE, THE SOFTWARE. (iv) STATEMENTS OR CONDUCT OF ANY THIRD PARTY. Yes. It’s very simple. We don’t collect ANY data about users downloading, installing or using the product, anonymous or otherwise. Period. To install TalkTime for PowerPoint, download the add-in and install it as shown below. Select the TalkTimePC.ppam file and then click OK followed by Close in the Add-ins window. TalkTime is now installed and you can see it on the right-hand side of the Transitions tab. To uninstall it, follow steps 1 to 3 above, select TalkTimePC and click the Remove button. PowerPoint™ is a registered trademark of Microsoft Incorporated, USA.